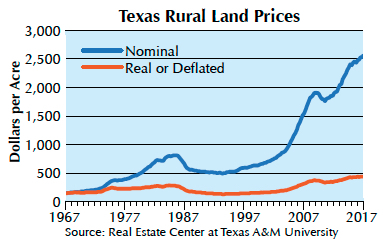 Statewide Texas rural land prices increased in first quarter 2017, moving up 3.26 percent to $2,563 per acre from the first quarter 2016 price of $2,482 per acre. The statewide typical size of 1,501 acres increased 240 acres over the first quarter 2016 size. The 5,343 sales pushed transaction volume up to 353 sales more than in first quarter 2016. Total dollar volume amounted to $915.857 million, falling short of the fourth quarter 2016 total by $38.8 million and exceeding first quarter 2016's lackluster total of $903.7 million. The real price settled at $443 per acre in 1966 dollars. 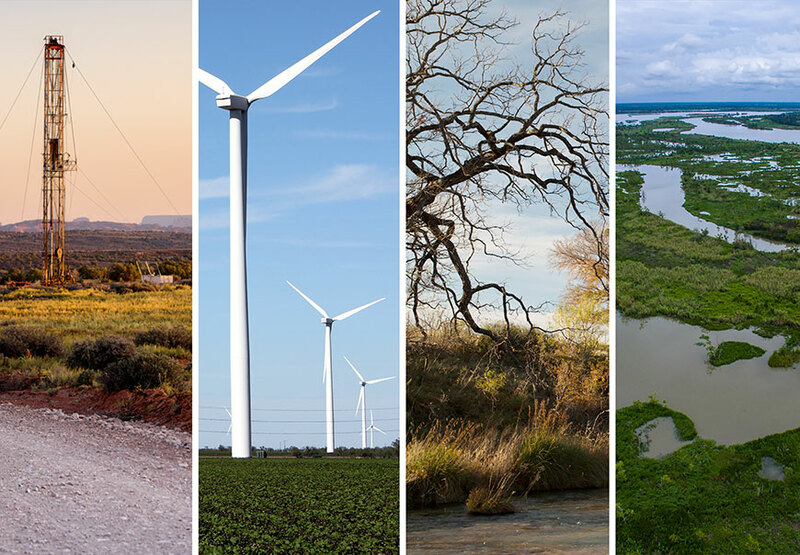 These factors document another record-setting year throughout the state. 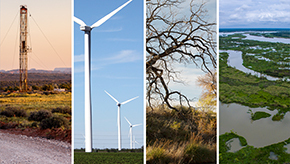 However, market conditions in some regions of the state diverged, resulting in widely varied regional trends. 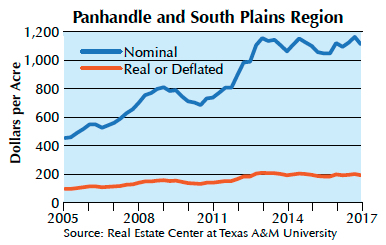 Panhandle and South Plains regional markets took a breather in first quarter 2017 after expanding for five quarters following a three-quarter retrenchment in 2015. At $1,110 per acre, prices in this region inched down approximately 0.72 percent from first quarter 2016 levels. Volume of sales lagged from a year ago, settling in at 283. Low commodity prices have challenged farmers, threatening them with operating losses. However, abundant cotton yields saved the day in 2017 allowing many to cover costs and make modest profits. Dairy farmers contributed to upward pressure on irrigated land prices. Far West Texas observers saw industrial uses associated with the drilling boom in the Permian Basin drive prices dramatically higher in fourth quarter 2016 and continue at those levels in first quarter 2017. 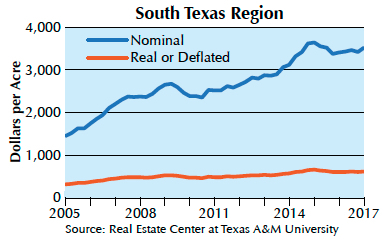 Overall prices in the region substantially exceeded 2013 prices and prior years. High bonus payments for mineral leases and purchases of land to secure water rights for municipalities put pressure on prices where the low level of activity in that region limits the statistical validity of indicated prices. 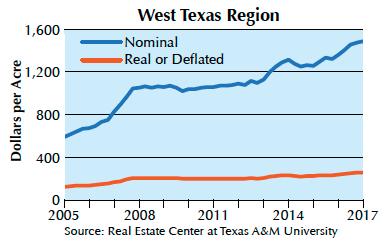 West Texas regional markets posted strong price growth but dwindling levels of activity. At a 9.2 percent annual growth rate, prices expanded to $1,486 per acre compared with $1,360 per acre in 2016. However, the 506 reported sales fell well short of the 605 sales in first quarter 2016, suggesting potential buyers may be resisting current price levels. Observers reported variable market conditions during 2016 and look for modest future price growth. 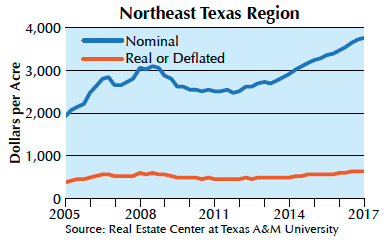 Northeast Texas reported robust market activity in 2016 with prices climbing more than 8.6 percent. The 1,781 sales eclipsed first quarter 2016's total of 1,576 sales. At $3,748 per acre, prices continued their strong recovery from 2011 lows. An uptick in oil and gas activity in the Haynesville Shale as well as robust recreational demand contributed to this strong performance. 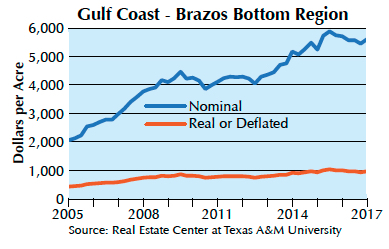 Gulf Coast–Brazos Bottom land markets saw prices decline for the fourth straight quarter,​ settling at $5,606 as low energy prices finally took a toll on the Houston economy. The 1.9 percent decline from the first quarter 2016 price marked the fourth straight quarterly price decline. Nevertheless, activity expanded, rising to 728 sales for an 18.5 percent increase in volume. In addition, the 1.9 percent price decline was the smallest since second quarter 2016, suggesting that retrenchment may be ending. Observers noted continued demand for cropland and pastureland. South Texas markets appear to have turned a corner in fourth quarter 2016 with a 1.3 percent price increase continuing with a 3.1 percent rise in first quarter 2017 prices. Those positive results followed four quarters of declining prices beginning with fourth quarter 2015. The $3,507-per-acre price coincided with a sizable expansion in activity at 498 sales, a 27 percent increase over first quarter 2016 levels. Observers suggested a reduced number of offerings contributed to strengthening of market prices. 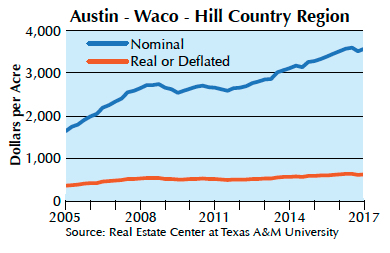 The Austin–Waco–Hill Country area had price growth continue at muted levels in fourth quarter 2016, rising 1.8 percent and continuing at 1.9 percent in first quarter 2017. The inflation-adjusted real price declined a modest 0.2 percent. The nominal price was $3,571 per acre based on 1,527 transactions, a significant increase from 1,464 in first quarter 2016. Continued demand for development and recreation drives this market. 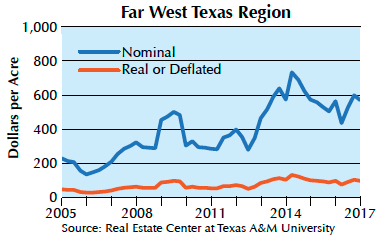 Although Texas' statewide market price expanded to a new high, deflated prices have changed modestly since 2015. Prices suggest that price increases have moderated from rapid growth in 2013–14. As 2017 closed the book on a bruising election process, optimism reigned in the overall economy. Brokers reported noticeable increases in phone calls following the election. However, many have indicated the increase in inquiries has not translated into an uptick in transactions. Perhaps continuing uncertainty about the political and economic environment coupled with low commodity prices continues to weigh on potential land buyers as they struggle to make sense of the new world in Washington. At the close of first quarter 2017, emerging signs hint that the euphoric optimism following the election has begun to wane. Despite OPEC cutbacks and an uptick in oil prices, petroleum storage totals continue to rise. In addition, supplies of agricultural commodities continue to outstrip demand, signaling weak operating conditions for farms and ranches. In short, the next six months promise to be confusing as the country and the world sort out the implications of this uncertain environment. Dr. Gilliland (c-gilliland@tamu.edu) is a research economist and Su a research assistant with the Real Estate Center at Texas A&M University.